Gopal Sharman’s contemporary dramatic interpretation of The Ramayana in English took the international theatre world by storm from the 70’s through to the 90’s when it was performed by legendary actress Jalabala Vaidya in a solo tour de force on Broadway, the West End, United Nations Headquarters, National Theatres of Europe, Canada and 35-plus cities and towns in India. 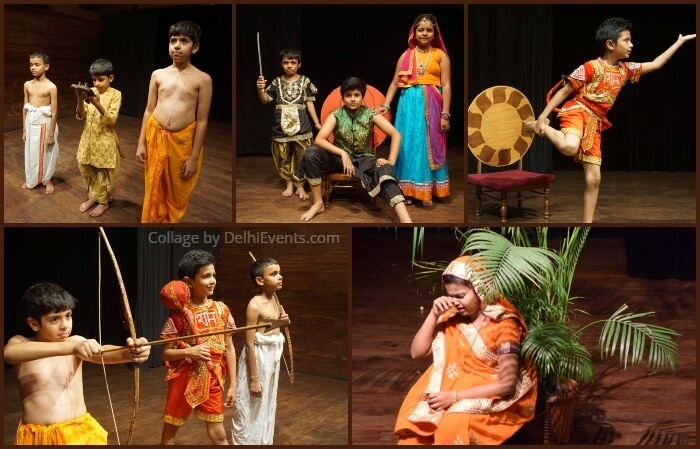 Now Gopal Sharman’s Ramayana is seen in a new avatar, as a play for intelligent children with questing and curious minds. Important episodes from the play are woven into a stimulating story, exploring the philosophical, political and spiritual premises of the epic -- creating an exciting and innovative theatrical experience. The play is best enjoyed by children between 7 and 14 years. It is a story of the magic of theatre and the grace of Shri Rama “in whose grace the dumb babble love’s profundities and the lame prance gaily over unscaled peaks”. Performed by Akshara’s Diksha students Sharan Makhijani, Aadya Sinha, Ujaan Sen, Arham Agarwal and others.